Duane Stateler and his son, Anthony, are the fifth and sixth generations to operate their 1,000-acre soybean, corn, wheat and hog farm. Raising livestock and managing manure requires increased attention to conservation, but it’s always been a priority for the Statelers. 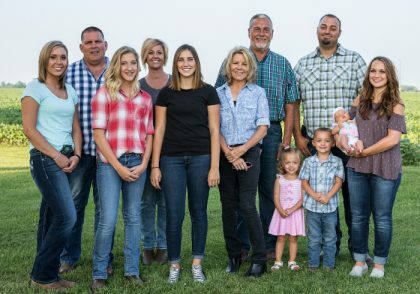 Their farm is part of the Blanchard River Demonstration Farms Network (BRDFN), an initiative designed to showcase and demonstrate innovative conservation practices for improved water quality. In addition to cover crops, the Statelers use many other conservation strategies like variable-rate manure application and adherence to the 4Rs. 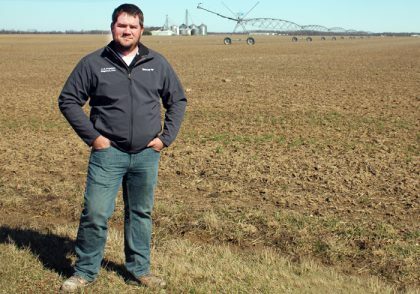 “Many people expect there to be one thing they can do to solve a problem like runoff, but, depending on the scope, size and cropping system of your farm, there is a long list of practices that should be incorporated to be effective,” explained Duane. The Statelers’ farm is currently the only BRDFN site to use drainage water management structures as a way to stop phosphorus from leaving their fields through the tile. These structures give them more control over the water table in their fields, which allows them to reduce nutrient leaching while also controlling moisture levels during critical times like planting and harvest. For further runoff control, they installed a phosphorus removal bed, which acts as a filter for water coming from the drainage tile. It uses steel slag, a phosphorus sorption material, to trap phosphorus before it gets into surface water. Watch this video to learn more about conservation on the Stateler farm from Duane and Anthony. 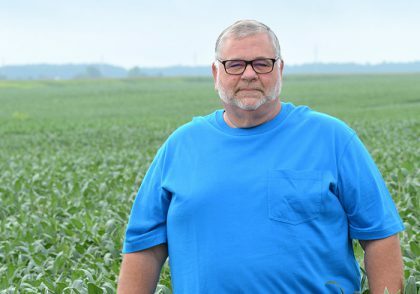 Bill Kellogg is a fifth-generation farmer who grows soybeans, corn, wheat and some sunflowers with his son, Shane. Bill began implementing conservation practices like grassed waterways and filter strips 25 years ago. Over the years, the Kelloggs expanded environmental efforts to include subsurface drainage, cover crops, minimal tillage and variable-rate technology for precise fertilizer placement. Bill and Shane follow 4R nutrient management practices and participate in the Blanchard River Demonstration Farms Network, which showcases leading-edge work to improve the Great Lakes’ water quality. In addition, they plant four to five acres of sunflowers annually to provide a habitat for bees, butterflies and other pollinators that are vital to crops. “Focusing on doing right does require more on-farm management, but it’s worth the investment. We need to protect our environment so our family farm remains prosperous and future generations can enjoy the land and water,” said Bill. Watch this video to learn more about conservation on Kellogg Farms. 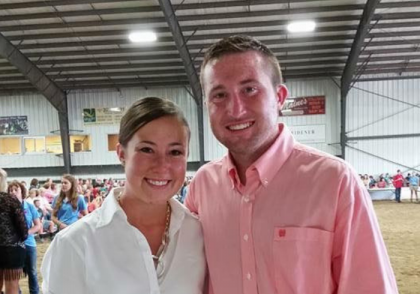 Alissa and Andrew Armstrong are siblings who actively collaborate on their family farm in Clark County. Growing corn, soybeans and hay, the Armstrongs prioritize conservation by implementing sustainable practices in their fields. Most recently, they installed subsurface drainage tiles to allow for healthy water flow and to minimize the risk of contamination. 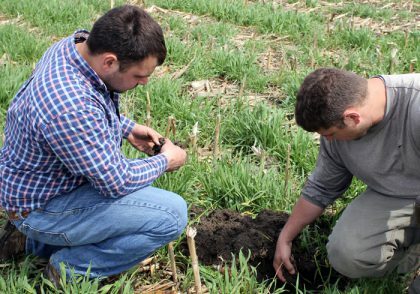 As no-till farmers, they care for their soil by keeping it undisturbed and also use grid sampling to prescribe specific fertilizer needs for each acre. This strategy ensures their crops get the nutrient support they need without wasting resources. When applying fertilizer, they apply at the correct time in the correct amount in the correct locations to reduce the risk of runoff. Natural buffer strips like tree lines and surrounding Conservation Reserve Program ground also protect their fields from water sources. Brothers Andy and Brian Stickel utilize no-till for about 85 percent of the corn and soybeans on their family’s farm. They also plant cereal rye and other cover crops in standing corn stalks for living coverage and soil enrichment. Cover crops and soil testing are effective components of their livestock nutrient management plan. In an effort to use minimal fertilizer, they plant 15-inch rows of soybeans and 30-inch rows of corn, banding it in the strip 2-3 inches deep on each side of the row ahead of the planter. This method helped eliminate phosphorus and fertilizer applications in the fall. Bret Davis has implemented conservation practices on his family farm to improve its safety and sustainability. Davis Farms utilizes a variety of practices, including buffer strips and variable-rate technology, to keep the nutrients applied to their fields where they were placed. Focusing on soil health is the most important aspect of the farm’s operations. Davis plans to continue improving soil structure by eliminating compaction, enhancing drainage and ensuring cover crops are keeping the ground covered at all times. 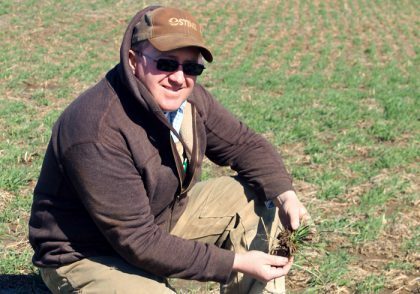 John Kraft plants cover crops and utilizes no-till to keep soil in his fields and out of the water. Soil is tested on a three-year rotation to monitor nutrient levels. He also participates in Farm Service Agency Conservation Reserve Programs that align with his desire to maintain habitat diversity and support wildlife such as wild game and songbirds. Warm season grass buffers have been added along field edges for water quality and approximately 4,000 trees were planted to increase wildlife habitat. Nate Douridas is the farm manager for the Molly Caren Agricultural Center, which is home to Ohio’s annual Farm Science Review. Conservation efforts playing a major role in operations. No-till, strip-till and vertical-tillage are all utilized in different areas of the farm along with buffer strips in fields intersected by the Deer Creek. Regular soil testing helps him create the plan for nutrient management, which is applied using Variable Rate Technology (VRT). Planting dates are critical to ensure crops are ready for harvest during demonstrations at the Farm Science Review in mid-September. Cover crops include reduced rate wheat, oats and Lynx winter pea for easy spring burn down. Water control structures help manage soil moisture as part of the Edge of Field research program. VRT is used for spring planting prescriptions based on soil moisture and drainage capabilities. Meiring Poultry has built a reputation for making conservation a priority. Bill Knapke, who runs the poultry, hog and row crop operation, has implemented several practices to monitor and improve soil and water quality. These include waterways, cover crops and no-till practices to prevent erosion and help hold nutrients in the soil. The farm also features wetlands that help filter and slow down the water to help reduce the flow of nutrients. They follow a nutrient management plan and Bill utilizes a manure storage facility to hold fertilizer until it can be sold and applied at the right time. In addition, the farm hosts two Edge of Field water monitoring stations to measure nutrient runoff of different farm practices and utilizes an iron slag filter, which catches and retains phosphorous from drainage water. 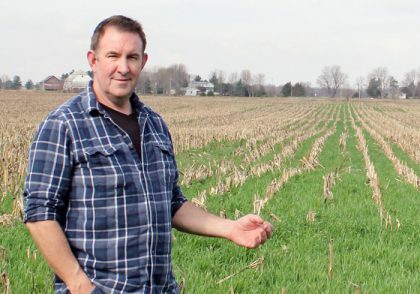 Lane Osswald and his family utilize several conservation practices, including no-till and cover crops to protect the soil from erosion and prevent nutrient run-off. They also conduct soil tests and use variable rate technology to apply the right nutrients and fertilizers at the right time. 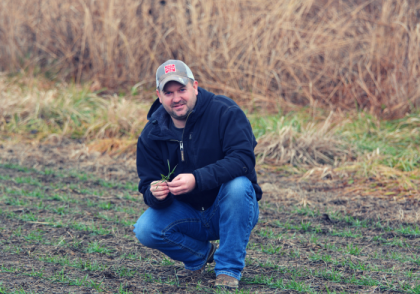 As a certified crop advisor, Lane combines initial recommendations from the local co-op and adjusts them based on historical knowledge and farm data. He sees results from these agronomic practices paying off in his field because the soil holds more moisture and withstand dry spells in the summer. 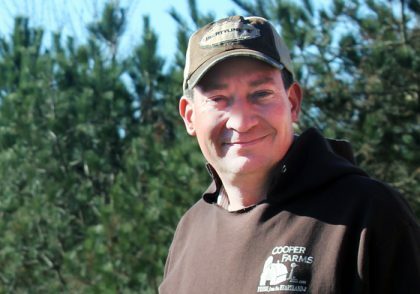 Chris Kurt and his family have utilized conservation practices for more than 20 years. They no till soybeans, use a drainage control structure to shut off field tile in the winter and employ grid soil sampling to help them understand when and where to efficiently apply fertilizer using variable rate technology. Recently, they elevated their commitment to improving water quality by joining the Blanchard River Demonstration Farm Network. This program will help them test their current practices, identify areas for improvement and share results with other farmers. One of the areas of research includes a two-stage ditch. They will continue their current practices on one side and implement new techniques like no-till corn and cover crops on the other to compare results. They’ve also installed a phosphorous bed to help extract excess phosphorous from water before it leaves the field and plan to do something similar with a nitrate filter. 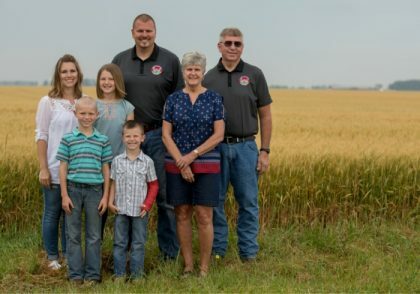 Ryan and his family employ a variety of conservation practices including buffer strips along ditches and minimum tillage to help retain moisture and nutrients in the soil. They also use water control structures to help prevent runoff after manure applications and utilize center pivot irrigation systems for precise nitrogen applications to crops. 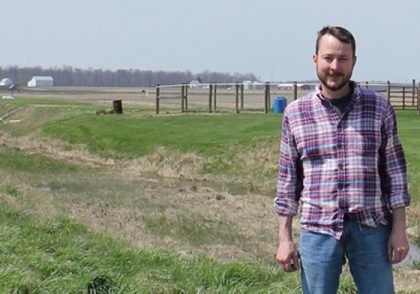 Several years ago, the McClures volunteered to collaborate with the Ohio Department of Agriculture to host edge-of-field water nutrient testing stations. This helps them understand the true impact of their farm practices on water quality and make improvements for the future. “We agreed to the edge-of-field water monitoring because we believe it’s important to understand what’s coming off our fields and how much is actually from agriculture when we talk water quality,” said Ryan.